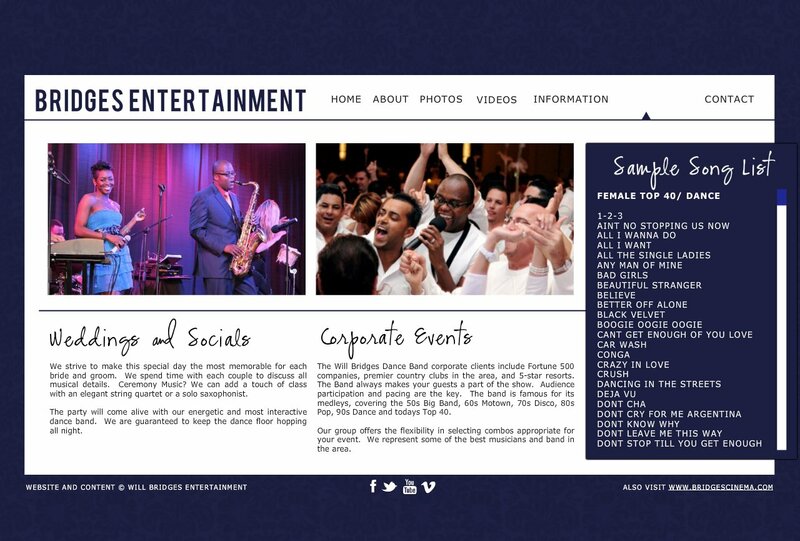 The Will Bridges Dance Band corporate clients include Fortune 500 companies, premier country clubs in the area, and 5-star resorts. The Band always makes your guests a part of the show. Audience participation and pacing are the key. The band is famous for its medleys, covering the 50s Big Band, 60s Motown, 70s Disco, 80s Pop, 90s Dance and todays Top 40. Our group offers the flexibility in selecting combos appropriate for your event. We represent some of the best musicians and band in the area. We strive to make this special day the most memorable for each bride and groom. We spend time with each couple to discuss all musical details. Ceremony Music? We can add a touch of class with an elegant string quartet or a solo saxophonist. The party will come alive with our energetic and most interactive dance band. We are guaranteed to keep the dance floor hopping all night.